Look what’s popped up on oto.my – an ad for the Subaru BRZ, which could mean the RWD sports car’s local introduction is imminent. About time too – we were told back in 2011 that the car would be set for Q2/Q3 2012, and in April last year this was pushed to Q4. High demand could have contributed to this delay, but could this be it, then? 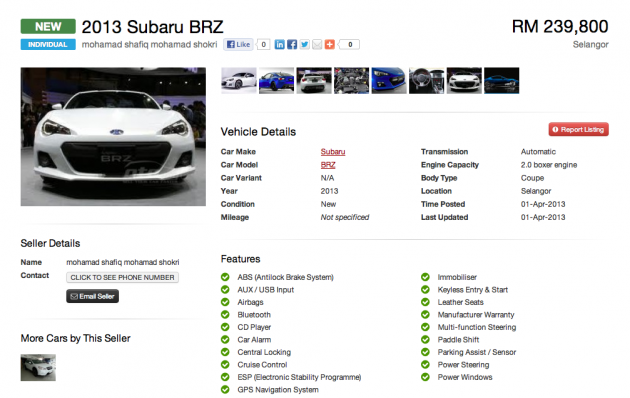 As you can see from the screen snap above, the listed price is RM239,800, and GPS is listed amongst its features, something the Toyota 86, the BRZ’s twin sister, doesn’t have. However, things aren’t official yet, so as always, we should take these with a pinch of salt for now. For more information on the Subaru BRZ, read our driving impressions report from Singapore. Subaru can do it himself. And the baby, WRX, is more cantiq than this one, likely to be more powerful(torque) too with turbo, although one has to admit that BRZ has the traditional sports car look. The only thing will be the higher price for fans. I totally agree with you bro, Glen tan is a LOUSY businessman. If it wasnt for his surname, he wouldnt even be manager of a burger stall, let alone a global brand like subaru. er..Glen Tan…as in Tan Chong…as in the family owns the company? i know that insurance in the UK is more expensive but this costs just 120k in the UK, pretty much prius money for a rwd sports car. really pisses me off how it costs 2x the price here, its so annoying. sounds familiar who those calling pendatangs to balik negara asal. What they failed to realize is that those who criticize the government over super expensive cars we have here, is because of the insane car price each Malaysian need to pay with their hard earn money compared to the rest of the world (not to look so far, just compare with neighbor Thailand). If you travel outside malaysia to see the world you won’t utter such words. Hurry don’t be a katak dibawah tempurung. Wow, ironically, they can fully own the BRZ for less than 1 year of freshy salary where else a Malaysia freshy needs to use 7 years of freshy salary to own one. Talking about overall ownership cost is just dumb. in the UK, a good car like the Focus is about 20k which is mid spec. a fresh engineer can certainly afford that on his newbie salary. here? the UK they can afford to fill up the car with unsubsidised petrol. here? can you do that? even then, they can choose to take commute on public transit, can you do it in kl reliably? our country done bad we shall not blame them, and instead, pack our bags and migrate? how common? or you only uncommon TABOO? lmao, ask your dad to send over some money then, you think if i got the chance to “pack my bag” i won’t? Aiyo, this is ye olde news.